In the pantheon of women we love here at Ex Rated, the preeminent spot would likely have to go to the one and only Gina Gershon. From her jaw harp solos, to her ability to consistently elevate mediocre fare to something approaching quality, to her delivery of lines about eating dog food, this multi-talented performer wins our hearts again and again. So we’ve decided to honor her with a Gershon-A-Thon! Join us as we discuss Bound (1996) and House of Versace (2013) this week on Ex Rated! Talking about the work of Don Hertzfeldt is like dancing about architecture. But we give it a go anyway with his emotional and ambitious feature length, It’s Such A Beautiful Day (2012). This episode also marks Ryan’s first foray into surly curmudgeonism as he rails against the government, the church, and leaf blowers. Join us as we go full get-off-our-lawn on Ex Rated! In what can definitively be called our gayest episode yet, we welcome Kyle Getz and Mike Johnson of the Gayish podcast to the show to discuss the excellent documentary about Hollywood’s depiction of homosexuals, The Celluloid Closet (1995). Ryan admits his crush on Susie Bright, Matt’s displays his acting chops, and Kyle and Mike question their podcast-guesting choices. Ex Rated: We Survive! 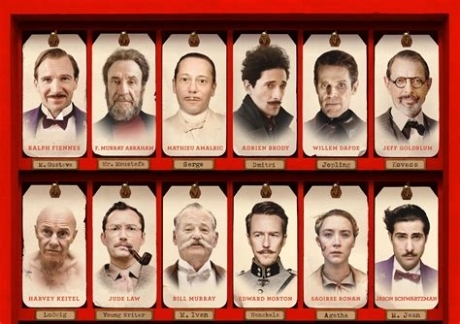 Wes Anderson’s The Grand Budapest Hotel (2014) is a magnificent spectacle of a farce that delights as it dazzles. It’s our sincere pleasure to talk about it. You’re invited to be an earwitness to us imagining Tilda Swinton helming her own Disneyland-ride-based movie franchise and the lengths Matt will go in order to get a bootleg copy of Feist covering Leonard Cohen. Ex Rated: Blowing the lid off Big Eye since 2017. For a healthy dose of giant robots fighting giant monsters, look no further than Guillermo Del Toro’s better-than-most blockbuster attempt, Pacific Rim (2013). Matt fawns over Charlie Hunnam, Ryan experiences a double event, and the English language fails weed eaters. Ex Rated: Our Nihilism’s Up! Episode 22 Faster Pussycat! Kill! Kill! If you like to see beautiful girls driving fast sports cars and breaking jockulatory-type he-men men’s spines then Russ Meyer’s Faster Pussycat! Kill! Kill! (1965) is right up your alley. Apart from discussing the movie, we consider some future roles for Liv Tyler, speculate on Oprah’s unrequited love, and invent another crappy superpower. Ex Rated: Our motor never runs down, baby! We’re back! Join us as we take a look at the Patton Oswald-starring existential dark comedy, Big Fan (2009). Is Jennifer Coolidge a suitable replacement for Ryan? How about McGruff the crime dog? Jerry Seinfeld, ’N Sync, and the ghost of Jumpin’ Joe DiMaggio are all invoked on this high stakes, season premiere episode of Ex Rated!